GAIA, the name chosen for a new Italian niche that recently opened in Jakarta's newest swank dining spot, actually came from a Greek word, gaea, which means Mother Nature. 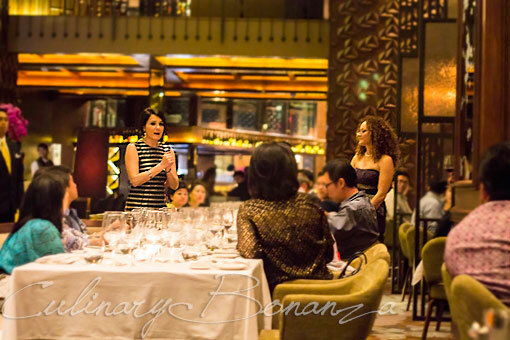 It is a symbolization of the way nature is infused in every aspect of the restaurant, from the solid wooden interior, to the food that celebrates the best of Italian cuisine. 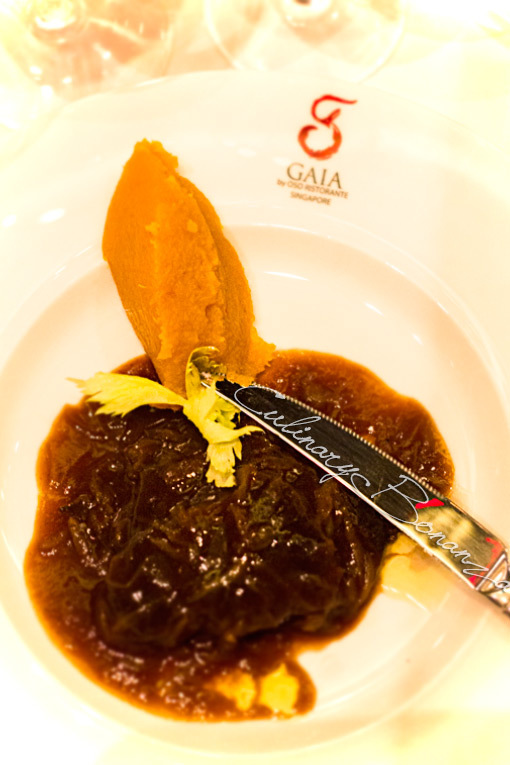 If you notice, the name is GAIA by OSO Ristorante, where the latter is the actually the name of an authentic Italian restaurant located in Singapore. In OSO's kitchen, Chef de Cuisine Diego Chiarini rules while General Manager / Restaurateur Stephane Colleoni commands the front line. Both distinguished gentlemen were present at the Enchanting Italian Night and I was really lucky to be seated with the 2 Joan d'Arcs of Italian wine industry: Silvia Altare and Sara Palma. Silvia Altare is the daughter and practically the heiress of her family-owned and run company, Elio Altare pioneers of modern Barolo (there's a long history about traditional vs modern Barolo war, click here). And Sara Palma is the Export Manager of Matteo Correggia winery and label, among the best producer of white Italian wine. In the male-dominated industry, these ladies didn't have it smooth in the beginning. It was difficult, because not only the age is stereotyped with experience, the gender bias was and probably still is very strong in the winemaking industry. Those tough old lads who had done things traditionally were especially the most difficult to convince about the modern ways. Before dinner started, guests indulged in "Finanziera alla Piemonteisa" of chicken liver pate served with bread crackers and "Bagnetto" parsley mousse and paired with white wine from Matteo Correggia Roero Arneis 2011. 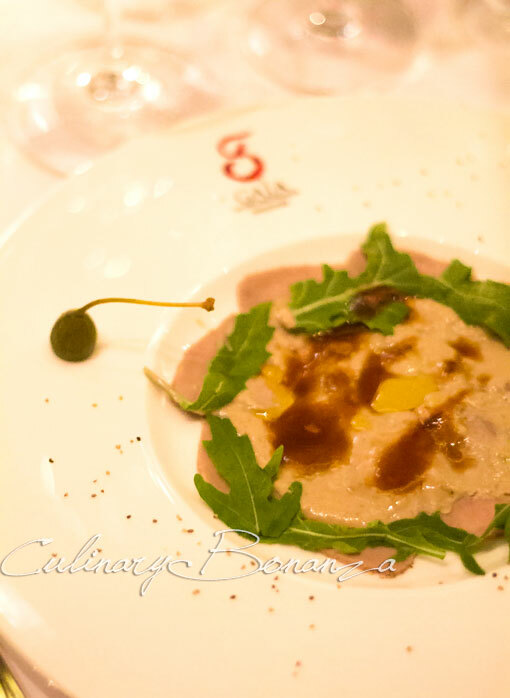 (above) Thinly sliced poached veal loin served cold with tuna and cappers sauce "tonnato". Wine: Elio Altare Dolcetto d'Alba 2010. The wine is described as dry but soft, delicate tannins, full taste of cherries and black cherry and as it is easy to drink, great to pair with an antipasto. (above) Ravioli filled with Porcini mushrooms, "Toma erborinata" cheese fondue. Wine: Matteo Correggia Barbera d'Alba 2009 & Matteo Correggia Nebbiolo d'Alba La Val del Preti 2009. 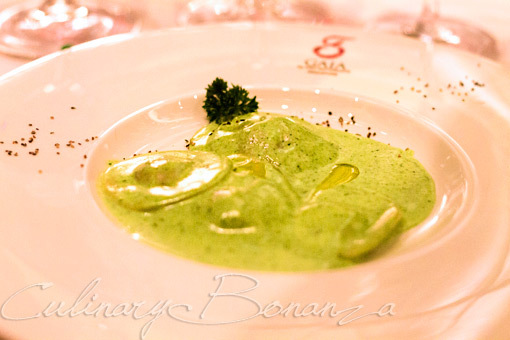 The cheese gravy still tasted cheesy despite the green colour and the filling was well done too. Even the Italians were deeply impressed by the ravioli! 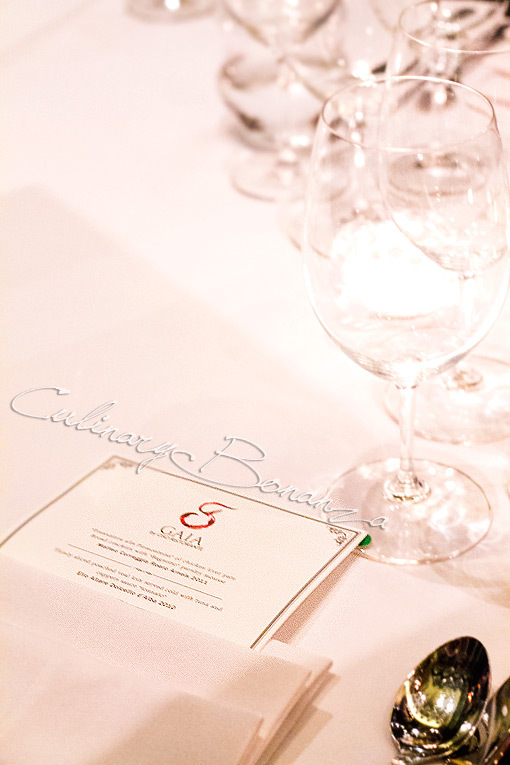 Wine: Elio Altare Barolo Vigneto Arborina 2007. The beef cheek was truly juicy and tender, my knife only served a perfunctory use of adorning my photo. The sauce paired very well with the meat, must be because both were Barolos. 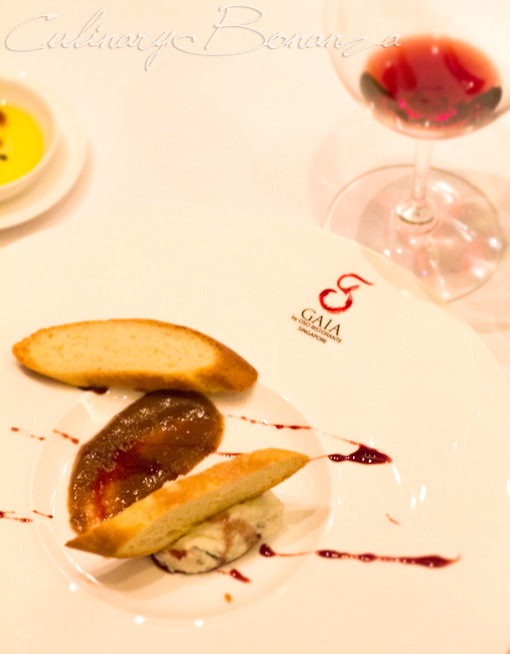 (above) Light blue cheese "Gorgonzola dolce", red wine reduction and slowly cooked pear in "Mustarda cogna"
Wine: Elio Altare Barolo 2007. It was a unique transition to dessert after the main course, an unusual combination of sweet and savoury. 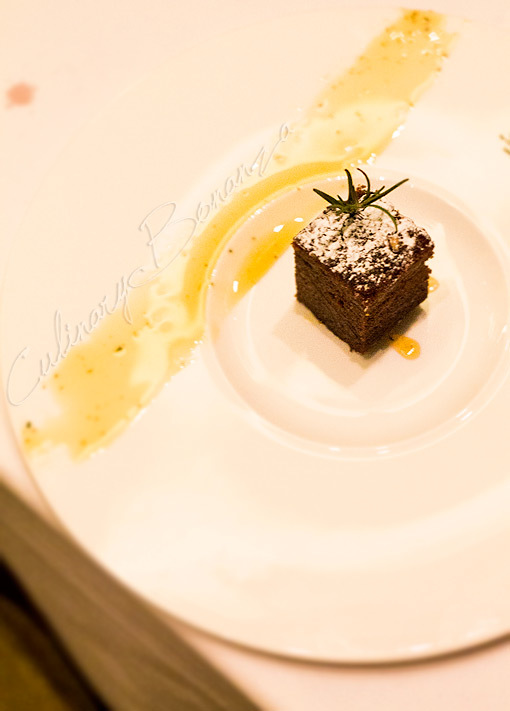 (above) Caramelized honey-hazelnut cake with rosemary, its own sauce. Wine: Moscato d'Asti, Domenico di Luccio. What better way to end the feast with something sweet like a chilled moscato wine? Cin cin!